The Long Hidden anthology edited by Rose Fox and Daniel José Older is diverse, globe spanning, fascinating, inspiring, and gloriously long. so long in fact, that it would be impossible to talk about my favorite stories in just one blog post. So I’ve split it into three. This is part two, click here for part one. 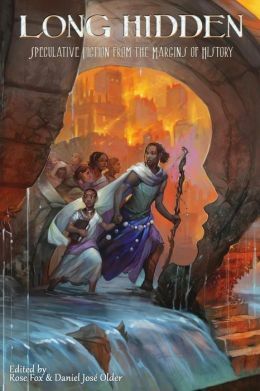 If you’re just joining us, Long Hidden: Speculative Fiction from the Margins of History includes over two dozen stories that aren’t usually told, or at least don’t typically make it to the mainstream. If you’re looking for some variety in your reading, and looking to support a worthy project of one of the smaller publishing houses, this is the anthology for you. Global points of view, characters of all genders and preferences, characters who maintain their dignity in front of the worst humanity has to offer, people who were brutalized and/or executed for standing up for people who couldn’t stand up for themselves. These are the stories of people who stood up and were heard, when surrounded by people who told them to shut up and sit down, if they deigned to speak to them at all. As I mentioned in the first article on Long Hidden, many of the stories had me doing web searches to learn more about what really happened. To that end, I have included some weblinks in the hopes that you too will be interested in learning more about the contexts in which these stories swim. Some of the characters might be fictionalized, but none of their circumstances are. “The Witch of Tarup” by Claire Humphrey (Denmark 1886) – Dagny has just recently come to the hamlet of Tarup, and a few weeks after she wed Bjorn Moller, he suffered an apoplexy (perhaps a stroke?) that rendered him unable to speak. The wind has stopped blowing, the windmill has stopped moving, and with no way to grind it the wheat will rot. Dagny is desperate for the assistance of the village’s local witch, and visiting the local wives for information. On a lyrically repetitive wild goose chase they send her, offering hints and suggestions, of who to get a scarf from, and who to have coffee with, and the like. A method of communication with her husband is finally suggested, and she learns who the witch is. This is one of the more light hearted stories in the collection, and quite fun to read.